On 15th November VP Forensic hosted a Children In Need event. Whilst many may think “not another charity fundraiser!” and although the initial aim of the day was to raise money ,it developed into being much more. The event had the obligatory bake sale, a traditional tombola (I won a Milk Tray), a competition to Beat The Boss and an Art Auction. Yes – you did read that correctly, an Art Auction. Leading up to the event VP Forensic asked their community clients to create artwork to be auctioned at the event. As you can see Pudsey was a favourite muse for the artists and the creations are remarkable. 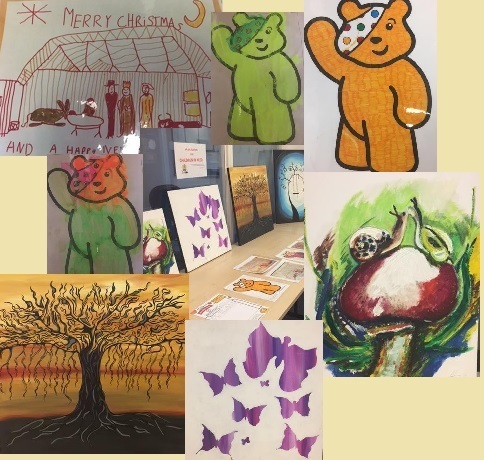 Currently, the art auction is still running until 4pm 17th November. So if you wish to bid please call 01623 726970 and get involved now! Not only did VP encourage their community clients to get involved, the Beat The Boss competition was opened up to all of their Support Workers, Nurses and visitors on the day. The competition was to challenge the VP Director, Phil, at table tennis. Who ever beat him by the biggest point score, or came closest to winning would have been awarded a £100 gift voucher. Many an eager competitor came and went throughout the day and the voucher has been awarded to VP Support Worker Andy Wootton – Congratulations! I have attended many charity fundraisers and often it becomes about reaching a monetary target. VP Forensic was not the exception, for all cakes, art, competitions running a donation was requested. So yes, they did want raise money. But where VP Forensic is exceptional is that it was a true community event that connected the VP Forensic business to its clients. VP stands for Valuing People and this event had people’s value at the centre.